are disposable gloves which are used by medical professionals during medical examinations and procedures which are deemed to be non-surgical, to reduce the risk of transmitting contaminants between health care givers and patients. They cannot be used for any procedures which are considered surgical, and or within surgery. They can also be used in professions that require the handling of food, and in laboratories and industries where there is a medium or low risk of contamination. Latex Examination Gloves were the first gloves used for medical purposes in moden medicine. Latex is still an excellent choice as it provides excellent fit, comfort, and is suitable for use in low and medium risk situations such as when handling wounds, and any non-invasive physical exams. Nitrile Examination Gloves are increasingly popular as it is suitable for people with latex allergies. Like latex gloves, they are an excellent choice for low and medium risk situations, but also come with a higher chemical and puncture resistance. Vinyl Examination Gloves are an economical alternative to latex, but provide a lower level of protection compared to latex and nitrile. They are only available as examination gloves due to their lower puncture and tear resistance, and so are only suitable for low risk situations such as when transporting patients or when carrying out non-invasive exams. Disposable vinyl gloves are however the most economical gloves for cost conscious facilities. As well as this, they have a soft feel, and are an excellent choice for people with latex allergies. Stretch Vinyl Gloves have similar properties to vinyl, but has increased elasticity that makes for a latex-free option that is more similar to latex. However, with much lower tear and puncture resistence than nitrile, these gloves are still recommended for low-risk environments. Stretch Vinyl Gloves are a cost effective alternative being priced between Vinyl and Latex Gloves. StaySafe™ examination gloves are ambidextrous, making them perfect for use on both hands, and are designed to reduce hand fatigue. They also come in sterile and non-sterile, with non-sterile gloves being suitable for non-invasive exams, and low-risk situations such as when transporting patients. 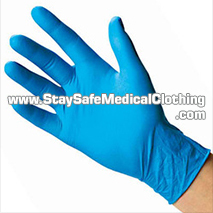 Non-sterile gloves however can also be sterilized before use, with various sterilization solutions. Finally, they come in various sizes ranging from XS to L, to suit all needs and preferences. Why should I use StaySafe™ examination gloves? 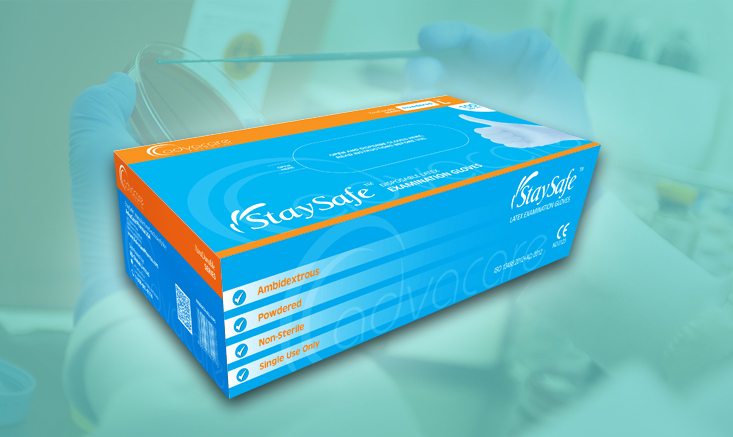 StaySafe™ examination gloves provide the highest degree of protection and strength. Even the standard gloves are made to be thicker than normal, to provide additional protection. What is the difference between powdered and non-powdered gloves? Powdered gloves are powdered with cornstarch or calcium carbonate to provide lubrication on the inside, to make it easier to slip the gloves on. However, these can cause rashes and other symptoms in people with a high sensitivity to these substances. For this reason there is also a non-powdered variety. What is the difference between sterile and non-sterile gloves? 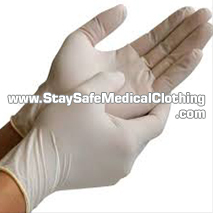 Sterile gloves are sterilized according to FDA standards, and have a lower chance of being produced with pinholes. Typically, non-sterile gloves are sterilized by someone other than the glove manufacturer, they are however still suitable for examination purposes, and non-surgical procedures. What is the difference between surgical gloves and examination gloves? The main difference between these is that examination gloves can be made to a lower level of protection, as they are only used for examination and non-invasive procedures. As well as this, they do not need to be in precise sizes or fit, and so come in fewer sizes. Can latex examination gloves cause allergies? Yes, latex gloves contain certain proteins which can cause allergies to those with a high sensitivity to them. This depends on their use and individual preferences and needs. Latex is strong and provides excellent resistance and fit, however is not suitable for people with latex allergies. Nitrile on the other hand provides the highest level of protection, but for this reason is the most expensive type of glove. Finally, vinyl is not as strong as latex or nitrile, and so is only suitable for low contamination risk situations, and also fit more loosely due to their limited ability to stretch, however they are the cheapest type of glove. Do you have more questions about our Examination Gloves? Contact Us!